Whatever the occasion, your good wishes deserve the most tasteful expression. Leave it to us. Ever notice that the typical gift basket is more show than substance? ~ how once you lift out the miniature-sized faux-gourmet stuff that you've never actually heard of, you find there's nothing in the rest of the basket except paper fill? Like the proverbial fruitcake, lots of the baskets out there are automatic candidates for "re-gifting." But not ours: everything in our baskets is extraordinary quality & full size ~ and our baskets are packed with delightful surprises all the way to the bottom. We use fill materials the way they were intended: to secure items in place and protect them, not to create an illusion. hundreds of beautiful ribbons means that every basket is tailored to the recipient & the occasion. Inside & out, each of our baskets is as unique as the special people on your list - no two are ever the same. We're even happy to work with baskets you bring us. Don't worry if your recipients aren't into natural foods - our individual approach to your order means we can delight all kinds of folks: naturals fans, 'foodies', and casual snackers alike. (Do tell us which sort we're tailoring the contents for.) Want proof? See what our customers say. or an elegant tray of carefully-selected cheeses to share with friends, let us make it easy for you to send your very best regards. We'll hand-deliver your basket to recipients in the southern Delaware County, NY and northern Sullivan County areas: Downsville, Roscoe, Cooks Falls, Livingston Manor, East Branch, Walton, Hamden, Delhi. Hand delivery can be arranged as well to addresses in the wider area, e.g. Oneonta, Liberty; please ask! 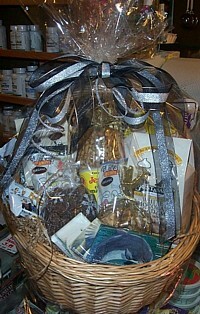 And of course, we ship to anywhere in the U.S.
Why do baskets make the perfect gift? Most of us have too much 'stuff' and are trying to simplify and clear out the clutter that inevitably accumulates; many times the last thing your recipient might want or need is another 'thing'! But everyone needs and loves to eat. 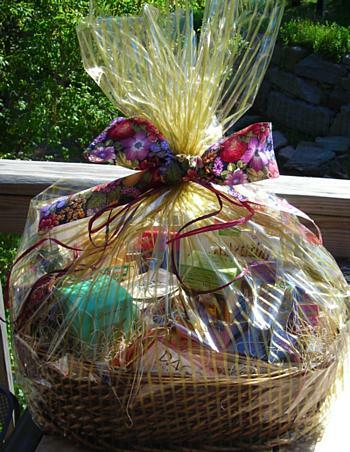 Great gift baskets are 'green' - each one a thoughtful collection of scrumptious, consumable items of outstanding quality: foods and/or body care, seed packets, candles, etc. These items are enjoyed thoroughly & used up; along the way they create warm memories, and don't accumulate in closets, garages, and under sink cabinets to create dilemmas and be landfilled or yard-saled a few years from now! 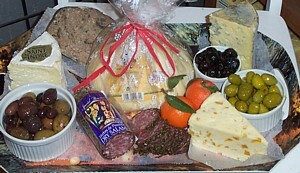 Food gifts are an easy way to buy local, regional, domestic, and/or consciously. Ultimately, even the basket itself is biodegradable, but in the meantime will provide service that's both practical & decorative - and it can be used for another gift basket...and another, and another! Yes. More likely, they'll love it. We don't have a formula for our baskets. First, each one is tailored to your recipient, based on what you tell us about them. Second, we think good food should taste great. If it's not delicious or delightful, it doesn't go in. If I ordered a basket from you last year for my recipient, and order again for them this year, will this year's basket be a re-run? No. We keep track of what you've ordered in the past for your recipients and what went into each basket they received on prior occasions, going back years. We make sure to make each item different than ones in previous baskets, unless specifically requested to duplicate a particular item because the recipients loved it the last time (which happens a lot!). If someone else orders a basket from you for my recipient, and I do too, will our mutual recipient get two duplicate baskets? Again, no. All our baskets are designed by one person, and thanks to our system for keeping track of who has received what in the past, both recent and for previous years or occasions, each basket is a delightful surprise. How is your pricing determined? 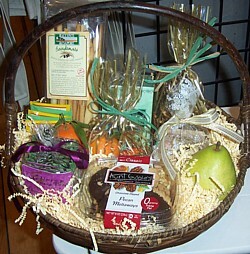 We charge only for the basket & trim, what goes into the basket, and the actual shipping cost. You get for free the time we spend designing, constructing, decorating, boxing & shipping. The prices of items on our shelves are very competitive - most everything in our store is on sale - and the price on our shelf is the price of the item when it goes into your basket. 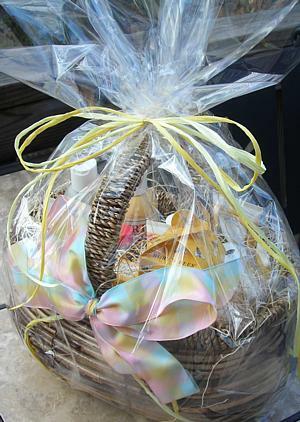 We think our baskets are the best gifting value anywhere! Is there a way for me to see what I've ordered? Yes. We take pictures of each basket. We'll e-mail you a picture, and if you like, a list of the contents, usually within a day of shipping. What other gift options do you offer? We also do small gift bags & boxes for wedding favors, business gifts for seminar attendees or office staff, and other similar applications. Each features a unique, signed piece of local pottery, so while theme and value are consistent within an order, each gift is special. Typical might be a small bowl in a delightful shape and glaze, filled with items appropriate to the specific occasion. Just click on the link below, or give us a call. What kinds of foods and/or other items they like (candles, skin care, pottery: whatever you have in mind). Just cut and paste the bulleted questions from the box above into your e-mail, fill in the answers, and we're good to go! Baskets - done right - are always a perfect gift.